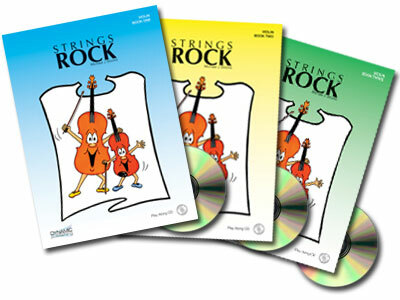 The new and exciting ‘Strings Rock’ series is a set of progressive tutor books for violin, viola, cello and double bass. Suitable for individual or group tuition, each book features tuneful solo melodies as well as several ensemble pieces. ‘Strings Rock’ features a backing CD, which includes accompaniment for many of the solo and ensemble pieces within the book. A Piano Accompaniment book is also available for books 1, 2 and 3. Each book calls for the student to be creative, by adding words or titles to pieces, as well as improvising and composing. "I am confident both teachers and students will enjoy using the ‘Strings Rock’ series. I have developed the series over many years of teaching, and feel that ‘Strings Rock’ will not only guide string players through the developmental stages of learning, but each book will be FUN to play. Happy music making! "